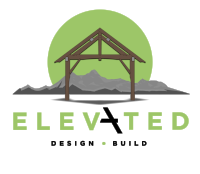 While every project is different, Elevated Design Build has developed a straightforward design and pre-construction process that allows our clients to clearly understand and navigate all the steps necessary to obtain a building permit and start digging. In Conceptual Design we will put together a floor plan that incorporates your Design Program with the property/surrounding environment, all the while paying attention to your stated budget. There are usually a few rounds of revisions where we can make sure you are happy with the direction we are taking the design. Once we nail-down the floor plan we will develop a basic 3D model showing the building forms, rooflines, windows/doors, etc. Once you approve the concept we will continue into Design Development, adding drawings such as building sections, elevations, notes and details. At the end of the Design Development stage we will have the information needed to build a Preliminary Construction Budget (see below). These drawings will also be ready to send to the Structural Engineer. It is important that we design a house that you can afford to build. It is a waste of time and money to do otherwise and can lead to heartbreak and resentment. It is safe to say that isn’t good for anyone. Our preliminary construction budgets include a detailed line-item estimate of all the costs anticipated for your project. We will work with our trusted subcontractors to build the budget and obtain other bids when necessary. We can then use this information to amend the design if needed, or proceed into the construction phase of your project. Our ultimate goal is a beautiful project and happy clients, the result of successful teamwork. We believe the best way to accomplish this is through full transparency, and as such we include a contingency for unanticipated overruns as well as the projected profit we stand to earn by performing our duties effectively. Elevated charges a fixed fee for building the Preliminary Budget. For this fee you will receive the line-itemed estimate as well as a detailed construction schedule. If you sign a Construction Contract with us, we will issue a credit for 50% of the budget estimating fee to be used towards construction. When you are comfortable with the estimated budget we will move into Phase 4 of the Pre-construction process, Engineering and Construction Documents. The Construction Document package is the information submitted to obtain a building permit and used by all the trades to construct your project as intended. This last phase includes structural analysis performed by a licensed engineer, which is required for every project we undertake. The engineer’s job is to verify the structure is safe and can resist the anticipated loads to the building. We will work with the engineer to ensure the architectural intent remains intact and an efficient construction process can ensue. At this point we will need a Soils Report to properly design the foundation. With the engineer’s approved drawings and our completed architectural design we will have the full Construction Document set and be ready to submit for a permit.